While we were docked in Phnom Penh on our Viking River Cruise, my wife and I decided to check out the Cambodian capital’s famous Night Market. After all, it wasn’t very far away from the ship and it’s one of those attractions that’s a magnet for tourists. So we disembarked and found a nearby tuk tuk to take us to our destination. A tuk tuk is a good way to get from one place to another very cheaply and quickly, and these two-wheeled carriages that are attached to a motorcycle seem to be almost everywhere. In fact, several were waiting onshore, hoping for cruise ship passengers to request a ride. We shared our tuk tuk ride to the Night Market with two passengers from the ship. We’d been told to travel as a foursome in order to get the best price per person, and also that it’s a good idea to work out the price and details beforehand. Well, our driver was very pleasant driver and open to negotiating. He took us to the market, followed us from place to place, and then took us back to the ship after a couple of hours. The total cost was less than $4 per person! When he returned us to the ship and we gave him a nice tip, he was so happy that he asked us to use him again the next day. 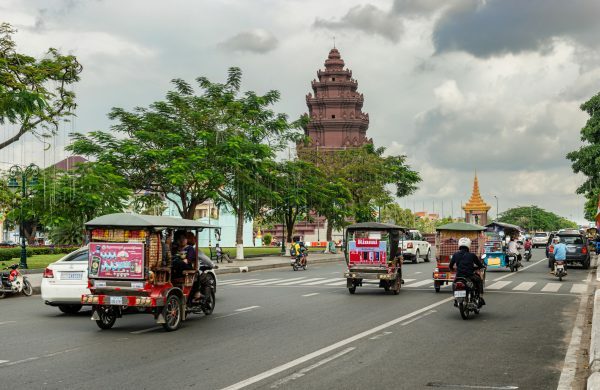 There are so many tuk tuk drivers in Phnom Penh that there’s a lot of competition for customers, and they are grateful for any business they can get. When we arrived at the Night Market, located near the river, we found it to be an intriguing mixture of loud music, street vendors, and Cambodian foods and goods. Here, you can see large masses of locals and tourists intermingling as they stroll through the well-lit streets or listen to live pop music, located on a central stage surrounded by banks of monster speakers. Indeed, the music was very loud! And on top of that there was the noise of the tuk tuks and the vendors selling their wares. The wafting aromas of all the various foods, including Cambodian sausages, grilled meats, and spring rolls was very enticing. It’s a great place to sample local food from the vast array of food stalls. There’s a nearby open space where you can go eat, with mats provided to sit on and enjoy the food. It’s quite crowded, but everyone is very friendly. However, there may be pickpockets on the prowl, so be vigilant about items such as your phone, camera, and purse/wallet. You can also continue strolling around while you eat, while at the same time bartering for the inexpensive clothing items, ornaments, and souvenirs offered at the stalls. There are also numerous bars and massage parlors to be found at the Night Market. Massages tend to be very cheap; a decent foot massage can be had for about $6. Even a full body massage is very reasonably priced. A glass of draught beer at one of the bars will set you back only about $1. 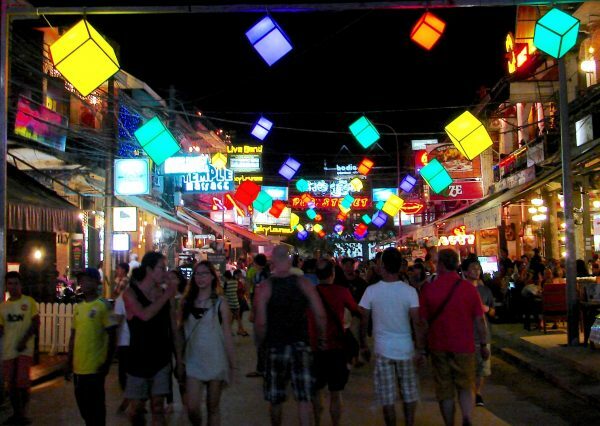 Yes, this area of Asia is still a bargain for tourists! 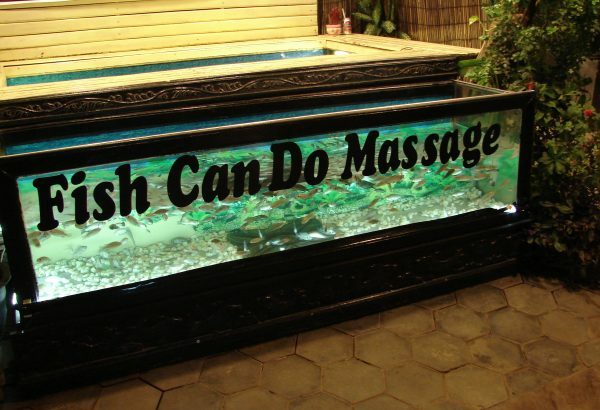 As we wandered around the Night Market, we were particularly amazed by the plethora of places offering cheap “fish massages”—and we marveled at the number of people willing to try it, including some of our more daring fellow cruise ship passengers. 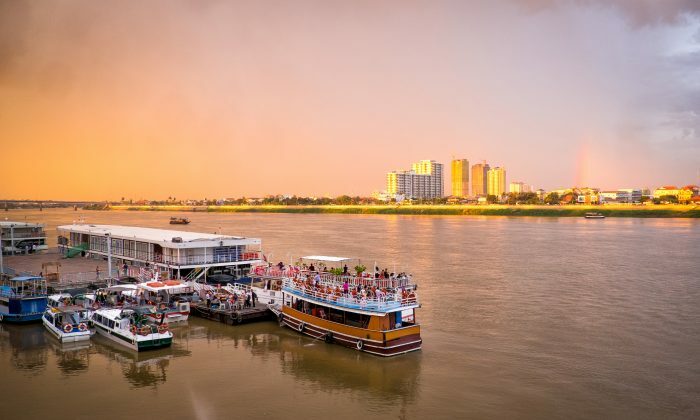 While in Phnom Penh, I’d also recommend taking in such attractions as the Royal Palace, National Museum, Central Market, Wat Phnom, Wat Ounalom, Tuol Sleng Genocide Museum, Choeung Ek memorial, and Independence Monument. John M. Smith is a travel writer and photographer who resides in Ontario’s Prince Edward County. We tend to assume that travel today is fundamentally different from what it was half a century ago. But is it true?